Superhero Captain America has been killed off after appearing in US comic books for 66 years. The character, who appears in the Captain America comic book, was created in 1941 to build up patriotic feeling during World War II. Co-creator Joe Simon told the New York Daily News: "It's a hell of a time for him to go, We really need him now." Publisher Marvel Entertainment has confirmed it is developing a film based on the character. 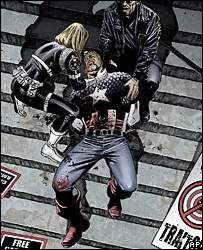 Fans may not have seen the last of the character in print either, as the comic's editor-in-chief, Joe Quesada, refuses to rule out resurrecting him in the future. The latest edition will show the superhero dying on the steps of a courthouse in New York, after he was shot by a sniper. Captain America first appeared nine months before the Pearl Harbor bombings, punching Hitler on the cover of the comic's first issue. Since then, Marvel has sold more than 200 million copies of Captain America magazine in 75 countries.